That's all she wrote from the secondary feature table in the Amazon Room! 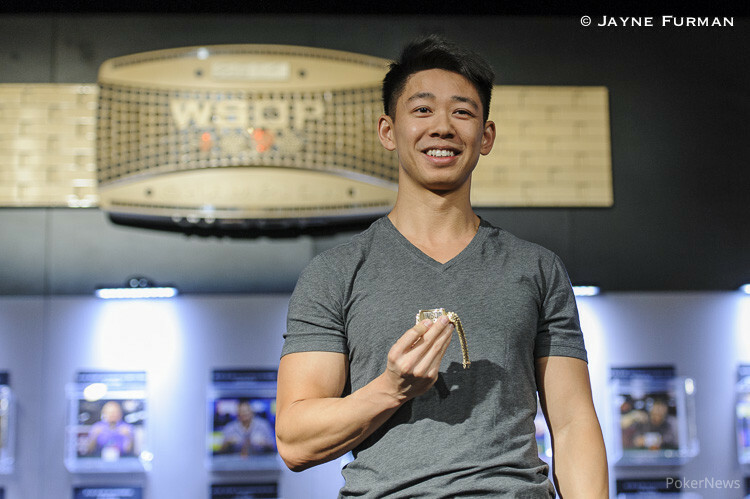 Tommy Hang has just defeated Jim Collopy heads up, denying the latter his second WSOP bracelet and in turn earning his first. 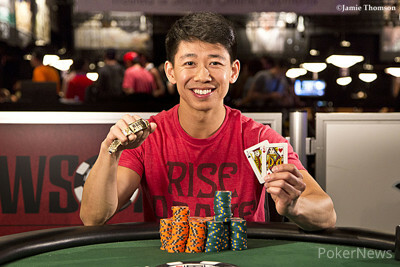 On top of adding his first piece of WSOP jewelry to his resume, Hang also clinched $230,744 in first-place prize money. The day began with 15 players returning to the felt with hopes of becoming the next champion. 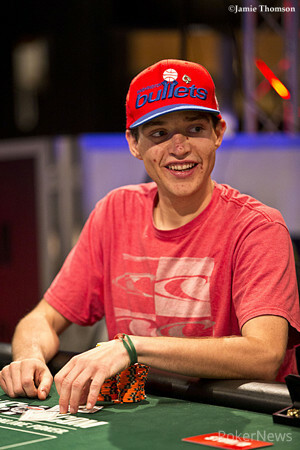 Coming into the day, storylines of different varieties existed, such as Dutch Boyd going for his third WSOP bracelet, Adam Friedman hoping to run up his short stack to earn his second, and David "ODB" Baker attempting to further prove his mixed game prowess by earning his second piece of gold. Unfortunately for those three players, Hang had different plans. During the early stages of the day players fell one by one while Hang gradually increased his stack. Early eliminations in the day included Mark Gallo (15th), Friedman (14th), Jon Turner (13th), Michele Limongi (12th), Boyd (11th), and Lonnie Heimowitz (10th). Following Heimowitz's elimination, the field combined to the unofficial final table of nine. From there, Jared Talarico became the official final table bubble boy, falling by the hands of Jim Collopy. The final table was set and Hang quickly became the star of the table. Hang began to push the action and consistently defeated his opponents at showdown, allowing him to ascend the chip counts quite rapidly. The first player to fall at the final table was Baker, denying him his quest for a second WSOP gold bracelet. Baker was eliminated by Joe Villella during the early goings of the final table and he took home $19,338 in prize money for his efforts. Following Baker out the door was Stewart Yancik. During a limit hold'em round, Yancik was crippled after running his pocket queens into Hang's on an ace-high flop. He was left short-stacked and was eliminated from play soon after. Chris George fell in sixth place, getting the last of his stack in the middle during a round of stud. George finished the hand with two pair, but was ultimately unable to beat Villella's trip kings. Despite scoring this elimination, Villella was the next player to fall. He was eliminated by Collopy in the next hold'em round and collected $47,905 for his finish. Despite doubling up several times and riding out the short stack, Brandon Guss became the next player to find elimination. His final hand occurred during an Omaha 8-or-better round where a button raise put most of this stack in the middle. Hang called from the big blind and the two saw a flop of . Hang instantly led out for one bet, which was enough to put Guss all in. He called for his tournament life and rolled over . Hang responded by tabling . The community cards finished off with the and the , giving Hang jacks and deuces for the elimination. Shortly thereafter, one of the most pivotal hands of the final table played out. It was a three-way hand between Hang, Collopy, and Kristan Lord that was capped on third street. Lord ultimately found himself all in against two opponents and unable to showdown the best hand. Hang and Collopy played for a side pot and each player ended up making two pair. Hang's were superior, however, and he was awarded the pot and a large chip advantage going into heads up play. Lord, on the other hand, was eliminated in third place for $96,894. Hang held an early lead in the heads up match and quickly made work of most of Collopy's stack. Throughout the battle, Collopy staged a few comebacks, but was never able to bring his stack back over one million chips. During the final hand of the tournament, Hang drilled his gutshot straight on the river to crack Collopy's pocket kings. Collopy became the runner-up for $142,533. Hang, on the other hand, was awarded his first gold bracelet. That does it for our coverage of Event 27: $1,500 H.O.R.S.E. Be sure to check out our Live Reporting page for all of the latest from the other events of the 2014 WSOP. Picking up with the action on fourth street, both players checked to receive their third board card. They each rapped the table a second time, allowing Collopy to receive a second queen on sixth. Collopy took this chance to move out a bet. Hang called and each player received their final card. Collopy bet once more. "Can I see his board?" asked Hang. The dealer spread his board closer to Hang. "I raise," he continued. Hang cut out a raise, Collopy looked at his hole cards, shrugged, and tossed out a call. "Straight," said Hang, rolling over for Broadway. Collopy mucked his cards and Hang was awarded the pot. He's now up to about 2.84 million in chips. Jim Collopy completed and Tommy Hang called. On fourth street Collopy bet and was called by Hang. Fifth street the action repeated itself. After pairing eights on sixth street, Hang would lead out and Collopy would just call. The dealer slid the down cards to the two players and Hang bet with his pair of eights showing. Collopy raised and Hang would spend several moments in thought, at one point asking for a count, before deciding to fold. Collopy scooped the 720,000 chip pot to move back to a million in chips. Jim Collopy was the bring in and Tommy Hang completed. Collopy called and the two were off to fourth street. Hang continued out with a bet on fourth street and Collopy opted to stick around. Collopy pulled a queen on fifth and folded his hand after Hang fired out a bet. Hang picked up the pot and now has about 2.67 million to Collopy's 670,000. Jim Collopy opened and Tommy Hang called from the big blind. The flop came and Hang check-called Collopy's bet. On the turn, Hang would check again but this time would raise when Collopy bet. Collopy made the call. The river was the and Hang led out this time and Collopy made the call. Hang showed for a turned pair of queens and a slightly flustered Collopy tossed his cards towards the dealer. Jim Collopy brought it in and Tommy Hang completed. Collopy called and the two were off to fourth street. Hang checked over to his opponent who cut out a bet. Hang called and Collopy paired up on fifth. He continued his aggression with a bet that Hang quickly called. On sixth, Collopy slowed with a check. Hang took this opportunity to fire out a bet. Collopy would not be swayed, though, as he came over the top with a raise. Hang called to see the final card. On seventh, Collopy came out with one last bet and Hang moved out a call. Collopy showed for treys full of fives. Hang mucked and Collopy was pushed the pot. He's now sitting around 900,000 in chips.